Summary: Penny Lee doesn't really feel like she belongs anywhere or with anyone (especially not her oblivious, dresses-too-young mother), and when she heads off to college, the last thing she expects to find is a friend in the form of hot coffee-shop Sam. Sam, who is amazing at baking and trying to put himself through film school, has a bunch of troubles of his own, and when he basically lands himself in the hospital, Penny happens to be there to help him. They swap phone numbers, promising to be each others' emergency contacts. Thus begins a story of two people reaching out to each other, who previously didn't have anyone to reach out to before. 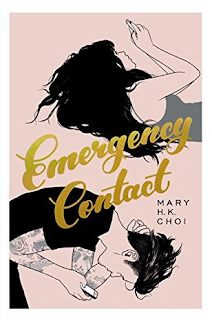 As they each navigate their individual lives, Penny and Sam find that they need each other for far more than just emergencies. Thoughts: This book was already on my radar, and after Samantha Irby shared this article, I knew I had to bump it to the top of my list. Firstly, I guess I had been expecting this book to be somewhat epistolary, but actually, it's third-person narration that switches between Sam and Penny. Their text conversations figure prominently into the story, which I had expected, but I didn't realize how much of the story would be about them separately. And that's fine. I wouldn't exactly call this a meet-cute sort of situation, but there are lots of cute moments that are interspersed between what is actually a story about some rather adult issues: racism, mental illness, sexual assault, parenthood, etc. And speaking of parenthood, Sam and Penny's parents are a pretty big part of the story as well, insofar as how they've affected their kids' lives and the lingering issues from the past that make the present difficult to navigate. Penny and her mother's relationship specifically reminded me of people I know personally, so that dredged up some feelings for me, but I love how it was handled, because even though those parts are told from Penny's point of view (and we can see what her gripes are about her mother), we can also see that Penny is not making great decisions either. She's not perfect. She can be selfish and aggravating. But we also find out that she has reasons for her behavior too. I really enjoyed reading this. I don't think it was perfect, but it was interesting and refreshing, and I can't wait to see more of Choi's work in the future.